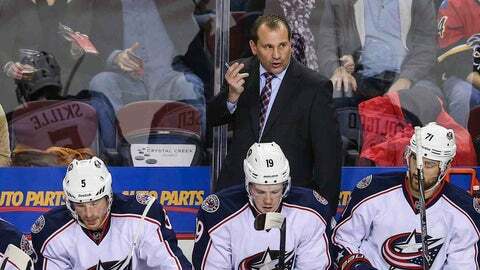 Calgary, Alberta, CAN; Columbus Blue Jackets head coach Todd Richards on his bench against the Calgary Flames during the third period at Scotiabank Saddledome. Columbus Blue Jackets won 2-1. The Blue Jackets sit seventh in the Metropolitan Division at 14-16-4 with the midway point of the season only about two weeks away. Are we witness to the growing pains of having the youngest team in the NHL that is in the first year of the “brick-by-brick” philosophy ushered in by John Davidson? The expectations were set after just missing out on the playoffs last year and only grew over the summer. The process of building the franchise the right way can be a slow one at times. There have been setbacks with injuries front and center. They have yet to play a game with a completely healthy roster. The big summer acquisition, Nathan Horton, is getting close to finally playing a game after offseason surgery. Marian Gaborik and James Wisniewski could return to the lineup as soon as tomorrow, but it was announced yesterday that fan-favorite Jared Boll will miss the next 3-4 months after undergoing surgery to repair a torn tendon in his ankle. Their third-string goalie, Mike McKenna, is “the guy” between the pipes after both Bobrovsky and McElhinney were sidelined. And yet, good teams find a way to battle through adversity. Columbus is starting to get back to what worked for them last year, becoming again a hard-working club. They have returned to taking shots and playing the game their way. They are putting forth more consistent efforts night after night. Having expectations of a better season, of building upon the foundation set previously, are what drives a hockey club. Yes, they got off to a rocky start again this year. The extreme ups and downs were an emotional rollercoaster for both the club and the fans. But Richards has expectations of what the team can do and he’s not willing to change that now. “I think that’s 100 percent accurate,” said Richards. “I think the expectations, you come in, and it’s more pressure. It’s harder. And that’s why you always have to tip your hat to the teams that are able to do it over and over. The Detroit Red Wings, you know the playoff run that they’re currently in right now, year after year (22 consecutive post-season appearances), that’s because there’s pressure. “That comes with expectations, not only our expectations but outside expectations from the media and the fans. That’s why you’re in professional sports, too. “But I do think that added some extra pressure. I think that maybe the expectation of starting the season picking up right where we left off, just expecting that that was going to happen. I don’t know if we realized all of the steps that we took to get to the level of play that we were at, at the end of the season last year. The dedication that it took, the sacrifice and discipline that it took. With not a lot of separation within the Metro and the current record of the club, there is surprise at the fact that they are still in the hunt for the playoffs based on the early inconsistent play of the team. Richards is just as surprised as most that they are a mere three points out from a guaranteed seat in the post-season. Did he think that they would be here with 48 games to play? “Based on our win-loss (record), no,” Richards said. “I think that’s it’s a thing that is disappointing, because if we could have found our game early, if we could have done some things, we could be in a better position. But, the other thing is that there’s still a lot of hope, even though we’ve played some poor hockey. The guys in the room are starting to gel, with chemistry forming among the players. They are beginning to play as if each game is THE most important game of the season. This worked for them last year and it’s a formula that should work for them this season. Much has been of the fact that the Blue Jackets have not named a captain since the trade of Rick Nash. There are leaders in the room, yet none have jumped up and grabbed the reins. It is conceivable that they could go through the entire season without naming a captain, while they wait for one of the “young guns” to emerge and mature. Maybe now we’re starting to feel more confident in our game because of how we’re executing our systems.